I might seriously have found some more time in my day! I quite simply to do not turn on my technology until later in the day! For me it is making a huge difference......there are so many things I would like to be doing and also need to be doing to feel good. my first page of my new moleskin journal! This week I have began my day sitting at my table. I have began my new scrapbook journal. 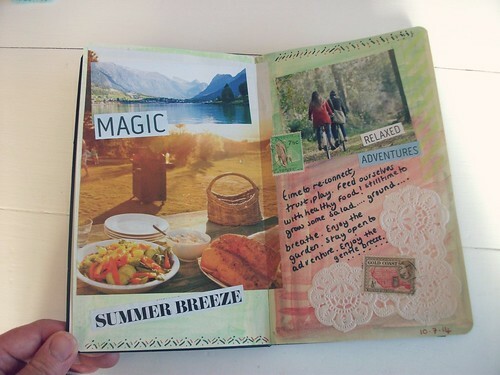 I hope it will lead me to some summer magic and relaxed adventures! I treated myself to this Moleskin journal. I spent so long looking at them in the shop the shop assistant may have wondered what I was up to.....I'm happy I splurged finally ♥ ♥ ♥ . 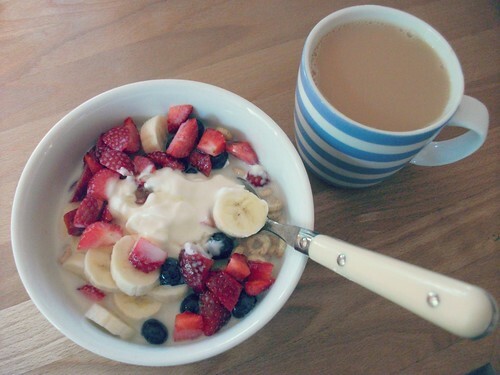 A nice thing to do in the morning. A little bit here and a little bit there. Some water-colour, and different bits and pieces to stick. I have some more pictures and words at the ready. So no more balancing breakfast over the key board, for now!.... These english rose strawberries are really the treat of the week. Delicious and aromatic...... real strawberries I think. A healthy burst vitamins, I could eat these all day. So I suddenly felt as though I had more time......I even did some stretching. My goodness journalling, stretching, time to think about what I wanted to do with my little red suitcase! I think I will need to be here less, and spend more time making in the 'shop'. Which I have also actually been doing! !.....can this really be my day! I have a few ideas swimming around, making new brooches and some new card ideas. I really want to make the time to do this. This was my Mum's red tyrolean apron. (We had several tyrolean adventures when I was little). I think it goes. 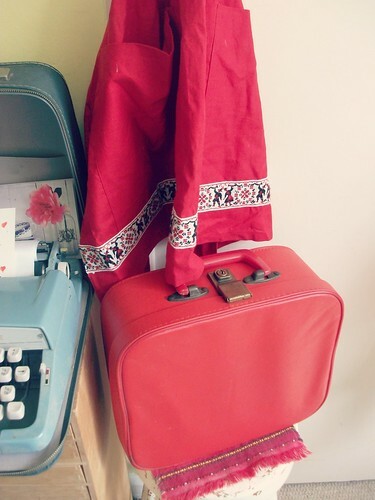 Definitely very my little red suitcase..... I have had lots of new ideas lately. I think she is guiding me. Here are my windowsill treasures. These are wild sweet peas from the garden. 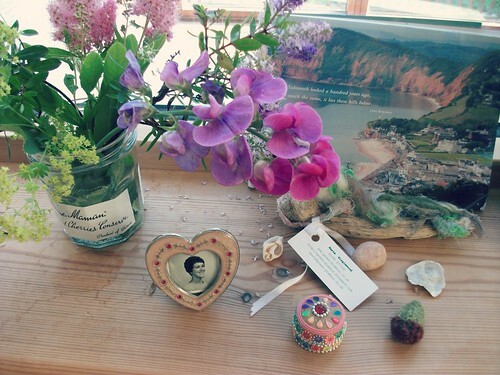 My Mum loved sweet peas and she loved Sidmouth (you can see in the picture) and she loved me and her grandson. 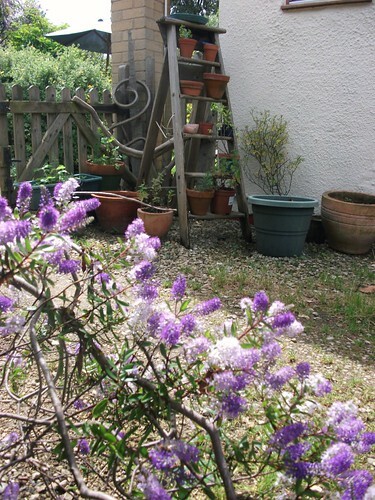 And we loved her and we loved Sidmouth and I love all the things I have that remind me of her. I love this little space here and all that it means to me. 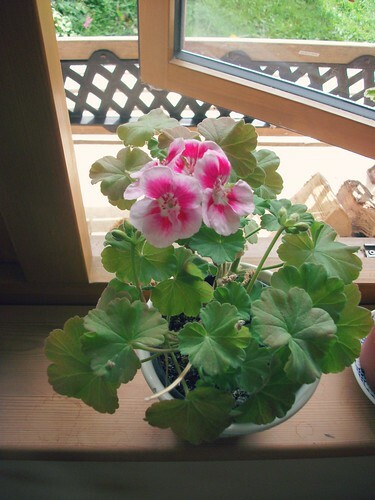 Inside my home I'm enjoying these bright pink geraniums. and outside home, I'm enjoying seeing this purple in the yard. 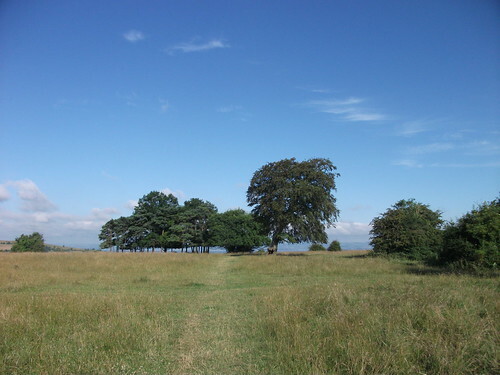 Our days on the common are glorious. The sky has been oh so blue. It's a real heavenly delight up here right now. 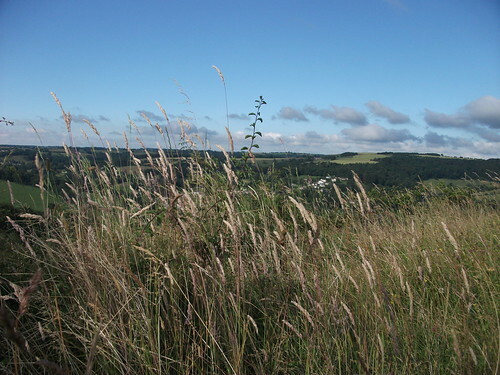 Summer grasses on the hill top. Our walks have been earlier and felt fresher. It's really nice to get out earlier. A spot of thrifting......I think I'm on a roll. 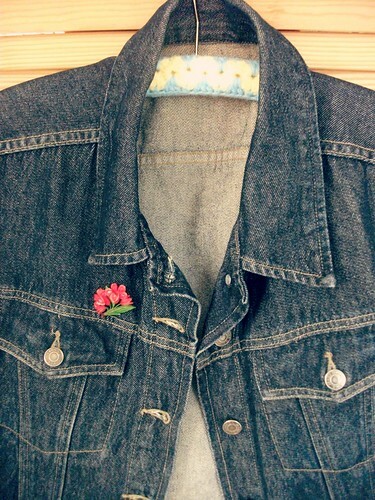 A denim jacket. It's about 20 years since I wore my last one.....and it feels great, like second skin..... and do I care? !....I don't think so. It's just asking to be decorated by brooches and badges. This is a vintage resin brooch, which belonged to my Mum. Yes she liked red, it was her favourite colour. So there you can see me with a bit more time to enjoy my things. It's all there for us to do. Our nice things are waiting for us. We can find time......forgive me if I'm not around quite so much. I'm also trying to end the day technology free too. This is all really quite different for me. I find myself thinking about you instead. Just trying to make the space for some new loves and old loves. Hope to catch up with you soon. it's a sign of our times I guess, but it's nice to try it differently. Thanks so much, Heather! You've inspired me. I think I need to de-stress a bit this summer! 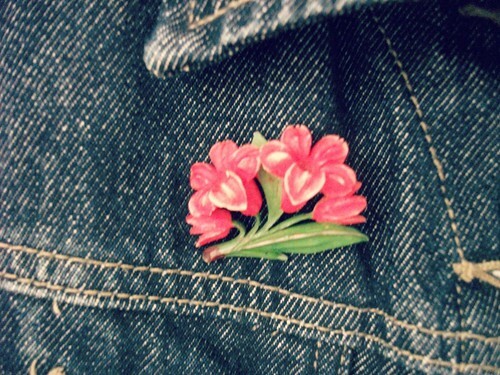 Your windowsill treasures, and the denim jacket with your Mom's brooch, and the apron and your journals... I don't know where to start from to say that seeing them/hearing your accompanying words made my heart happy! i love your journal. I keep one but it's all words - would be good to add some images and patterns too. I'm not so skilled at crafting but reckon I could manage this. Thank you for the inspiration. It sounds as if you have hit on the right combination of technology time and non-technology time. It is something I struggle with in my life as well. Lovely post! I loved this post! Finding balance in our life is so hard, but every now and again it happens and it's magic! I have very happy memories of Sidmouth. Thank you for reminding me of them. Glad you've managed to free up some time .... it waits for no man! that's true! it's funny time moves so fast on-line. In that hour or two, we can do so many other things......! You've inspired a good number of people with this post, myself included. I feel happy just thinking of the free time awaiting me. Yes; I am going to spend a computer-free morning tomorrow...and think of you whilst doing so. Super post! Glad you have clawed back some extra time in your day, and you have found lots to enrich it! 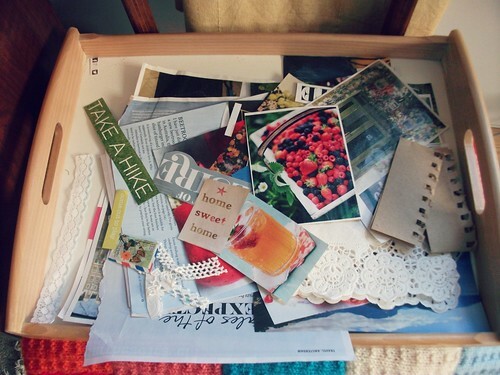 Love your thrifted goodies, your landscapes and the sneak preview of your journalling; thankyou so much for sharing! It's wonderful to have such memorable little pieces that can still make you happy even though that person/s are not around anymore!!!!! You're so right, when my laptop went to varsity I did so much more, especially early suppers!!! Now that it's back I find myself "wasting" time on pinterest but admittedly, sometimes it's good inspiring time too!!! Have a happy week doing what you love best!!! I have to completely agree with you about finding more time when you're not online! I am actually meant to be in my algebra class online right now, and here I have been messing about online!!! I truly miss my blogging buddies though and I miss finding out what they are doing, especially in the summer when everyone is creating and sightseeing! I love your journal as well, I truly believe in journalling and I have one just for my blog! How encouraging - I should probably take a leaf out of your book, perhaps what I will do sans wifi for the next 7-8 wks in our Brittany house!! Your art journal is going to be amazing.